In the last year, I traveled a lot — weeks and weeks, in fact — and ended up falling far behind on my magazine subscriptions. I usually catch up during the semester, sneaking a magazine in here or there, but last semester was so incredibly busy that I barely read any of my magazines. So here I am, in April, reading magazines from last August. Well, the good news is, I’m at least enjoying them, and catching up somewhat. 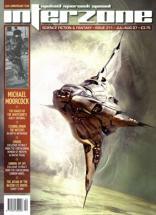 Asimov’s Science Fiction‘s issue from last August (2007) was one I was very eager to read. Rudy Rucker and Bruce Sterling are two of my favorite writers — but their story, “Hormiga Canyon” (excerpt linked), didn’t grab me as much as I’d hoped. It was fun enough, but it didn’t shine with the sophistication and wildness of some of the best work by either author. Still, it had its moments. I did get a big kick out of “Dead Horse Point,” by Daryl Gregory, and Jack Skillingstead’s “Thank You, Mr. Whiskers” reminded me of the weird thrill I used to get out of watching old Twilight Zone reruns… in a good way. I also was impressed with Kathleen Ann Goonan’s novelette, “The Bridge” (excerpt), less for the detectiveness of it — detective stories are my least favorite for of SF — and more for the glimpse of what I’m certain is the same fictional world as in her novel Queen City Jazz, which I picked up in Thailand, read a little of, was impressed by, but had to relegate to the read-later pile. Good story. The August 2007 issue of Fantasy & Science Fiction was a pleasant surprise. Indeed, it was better than a number of the issues preceding it in 2007. This is unusual, since much of it was fantasy, and the SF was more tropey and less sciency, if you know what I mean. But even so, I liked the novella — Albert Cowdrey’s “Murder in the Flying Vatican” — and everything else was at least interesting enough for me to read all the way to the end. This was especially shocking since I expected to hate Chris Willrich’s “A Wizard of the Old School” (because it’s extremely rare I like anything with the word “wizard” in the title, but for some reason, this story was actually sort of interesting to me). “The Tomb Wife” was alright, though a lot of the tropes were familiar, and “The Mole Cure” was fun, though I wanted more. “At These Prices” was the least convincing effort, though I learned long ago that Van Gelder has a very different sense of humor from me. But I have to say, if there was one thing that had me nodding my head, it was Kathi Maio’s critique of The Last Mimzy — despite her positive reassurances, it made me even more certain that I need to read the original story. Oh, and I don’t really understand why F&SF has two book columns, honestly. But hey, who am I, right? Coming Soon: reviews of Vernor Vinge’s Rainbows End, Bruce Sterling’s The Hacker Crackdown (a reread), and Naomi Wolf’s The End of America. And yeah, them links? Two out of these three books are available online, for free. In toto. Typical, too, that it’s the books by SF authors that are free, while the Wolf book, supposedly part of a crusade to save America’s future, must be paid-for if you want to read it.